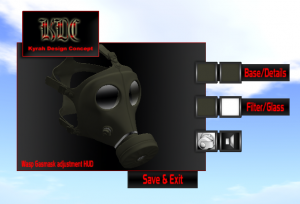 I spent the past 10 days coding the gas mask, uploading textures, making sound effects… all those things i still have to do before release. If everything goes well, I should be able to do the release this weekend, or even today; who knows. The main body (face and straps). The plastic elements (filter mount, strap clips, exhaust valve). Enabling/Disabling the breathing sounds as well as adjusting it’s volume. I’m not going to offer “one way mirror” glass for the lenses at this time, you are free to do it yourself should you want to, since the mask will be fully modifiable. The reason for this is that I want to set advanced material settings on the mask and there isn’t, a way to set and reset specularity parameters using a script, shiny has been packed into the specularity material parameters so I cannot set it without risking to overwrite the settings. For this same reason there will be a “matte” version and a “glossy/latex” version for you to choose from.